Harry Potter and the What? The movie was a decent adaptation of the book (not that it means much, since I didn’t really like the book) – until I remembered that the title was Harry Potter and the Order of the Phoenix. Then I realised that it didn’t seem to have very much to do with the Order at all. It was more like Harry Potter and His Visions. Overall, an ‘okay’ show – more fast-paced than the book. I rather liked the score, though. The major letdown for me was the fireworks scene. It was so hilarious in the book – frankly, it was the only thing I looked forward to seeing in the movie. Giant fireworks that never seem to fizzle out, explode magnificently if you try to stupefy them (they’re supposed to freeze when stupefied), and multiply by ten if you try to vanish them… Sigh. Oh well. It didn’t happen. It was funny, but it wasn’t as fantastic as I think it could have been. I thought the “romantic” scene between Cho and Harry in the Room of Requirement was a bit stupid. Primarily because of the mistletoe. Rather idiotic, although now that I think about it, maybe the Room decided that mistletoe was required and provided it. In any case, it was kinda silly. The Dumbledore-vs-Voldemort fight scene was very reminiscent of Star Wars’ Jedi-Sith battles, with all the bright light (blue and red too, haha) and sparks around. I wasn’t the only one who said it either – my friends felt the same way. One thing that puzzled me was how fake Hagrid’s Giant half-brother, Grawp, was. They managed to get Thestrals to look pretty realistic… And Dementors, and house elves… But they couldn’t get one giant to look believeable? The instant he appeared on-screen, you just knew he was fake. It was painfully obvious that he wasn’t real, standing next to Hagrid. After being accustomed to the good effects work in the previous Harry Potter movies, and in other blockbusters, that was a bit of a shock to me. Imelda Staunton was brilliant as the sickly sweet and cheerful, but menacing Dolores Umbridge (that too-sweet-smile of hers… brr). You know Staunton’s done a good job when you start feeling like smacking Umbridge or kicking her off the face of the earth. For me, that was about when she interrupted Dumbledore’s opening speech at Hogwarts. Pretty quick. Evanna Lynch played the part of the dreamy Luna Lovegood. She had that almost non-blinking stare which is really creepy in any situation, and a sort of ethereal, “wispy” voice that really gives one the impression that she’s living in her own world, and not always connected with reality. Another two cast performances that I’ve always liked in the Potter movies were Maggie Smith’s (McGonagall) and Alan Rickman’s (Snape). I like the character Professor McGonagall, and Maggie Smith hasn’t let me down yet with her portrayal of the Gryffindor head. Professor Snape I dislike, but I have to say that Rickman gives a remarkable performance as the cynical and biased teacher of Potions. Helena Bonham Carter as Bellatrix Lestrange? Genius casting. Her evil/gleeful/deranged laugh at being freed from Azkaban… And the way she Avada Kedavra-ed Sirius Black (sharp, sudden and direct – quite appropriate to Bellatrix, I thought)… Effective performance. 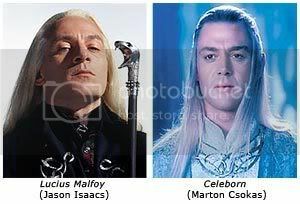 Every time I saw Lucius Malfoy in this movie, I thought: Celeborn. Elf. In the previous movies he never struck me as such, but somehow this time round, I kept thinking of Celeborn from Lord of the Rings (Galadriel’s husband). Maybe it’s just me, but… But… He really does have something of a physical resemblance, with that long golden hair and bearing. See? Perhaps the only scene I really liked was the one where the Order came to rescue Harry from Privet Drive. I find those flying scenes so fun. Pity there wasn’t any Quidditch stuff in this movie. In conclusion, for RM5 it was a good watch. Can’t say it was boring, though it isn’t the best of the Potter movies so far. (I still like Prisoner of Azkaban best.) I thought it lacked suspense and real exciting build-up, but that might be because the focus was on Harry and his dreams/visions and his emotional turmoil. Not a bad effort from director David Yates, all in all.